We believe one week can change you, and we have experienced it at Cuirim Outreach. This is why high school students return year after year, even into college. 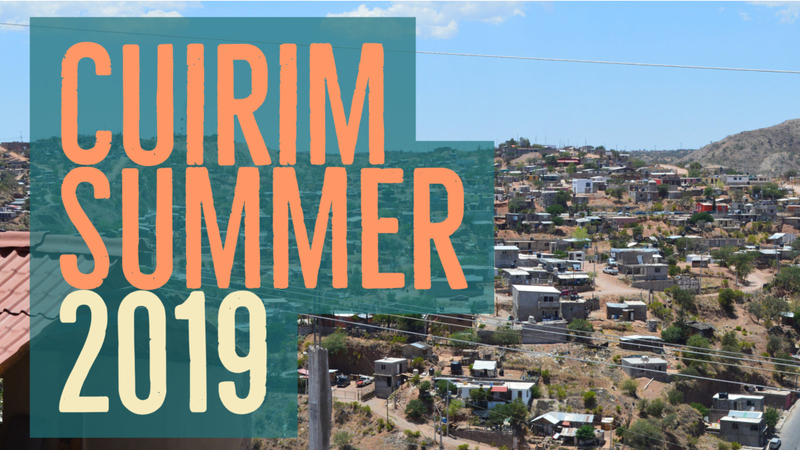 Cuirim 2019 is a week of service and relationships punctuated by three daily times of worship, prayer, and teaching. Our hope for Cuirim 2019 is that students would grow in their understanding of who they are, their relationship with God, and their responsibility to and relationship with the world. Sunday, July 7th – We fly from BWI to Tucson. Volunteers from an AZ church, drive us to Nogales, AZ and we walk through the border crossing and take a private bus to Cuirim House. Friday Afternoon – We bus back to the border and walk across for the journey back to Tucson where we spend the night in a hotel. Saturday, July 13th – We shuttle back to the Tucson airport for our return to BWI. Cuirim is an international service learning trip to Nogales, Mexico. It will be one of the hardest weeks of your life and also one of the most rewarding. We will come alongside a community church as they serve their neighborhood. We will be extra hands and feet to the work they are already doing. Fly out of Tucson, Arizona early Sunday morning and return to Baltimore late Saturday night. How does the group get from Tucson airport to the Cuirim House is Nogales, MX? Parishioners of a partnering church pick our group up at the airport and take us to the Burger King on the Arizona side of the border. There we meet our host, Brian Donovan and his team. All together we walk across the border. A private bus will be waiting for us and drive us to Cuirim House about 20 minutes away. Tell Me about Nogales, MX? Nogales is located along the Arizona border, about one hour south of Tucson. It used to be a sleepy, little, border town until the US and European companies established factories to take advantage of the cheap labor. People don’t plan on living in Nogales. They just end up there. People come to Nogales from further south with hopes of crossing into the US, but their hopes are seldom realized. One day they wake up and find themselves working in a factory for $1/hr, raising their family in a squatter’s village, and living in a house made of pallets and a dirt floor, without basic utilities like water or electric. Head back to the border on the private bus, walk across the border together and meet the partnering church parisioners to be driven to the hotel where we spend the night. Saturday, July 13 – Take the hotel shuttle to the airport to return back to Baltimore. Who is going on the Cuirim Trip? The trip is hosted by Central Presbyterian Church. High school students, their parents, and those who want to invest in High School students are invited to join the trip. You do not need to be a member of Central to join the trip. There will be one adult for every four students. The cost is $1300. This includes airfare, project costs, hotel costs, and travel insurance. If you are a member or regular attender of Central and are active in the High School Ministry, your cost is subsidized and the trip will cost $650. What about team security in Mexico? The State Department has issued travel advisories for Mexico and separately for each of Mexico’s states. We will be traveling to Nogales in the state of Sonora. Our security practices: We take two steps as extra precautions for our travel to Nogales and while in Nogales. The first step is to have adequate supervision. Central’s policy is to have 1 adult (over the age of 25) for every 4 high school students. The second step will happen while serving and playing in the community. We will have a adult at each location in the neighborhood where a student may be throughout the day. Our students are allowed to walk in groups between Cuirim House and the soccer field or worksite but will need to check in with a named adult at each location. Students are not allowed to travel alone or to unplanned locations at anytime. Will you interact with the caravan or other border issues? No. The caravan traveled to Tijuana, Mexico. We will be working within an established neighborhood with the church that serves that community everyday. You should see your physician and ask about immunizations for visiting Nogales, Mexico. All the water that you drink will be bottled. Preventative Health Practices: Sunblock and mosquito repellent are on packing lists as well as provided by the team and always available at a central location. The $400 deposit is due March 1st along with a copy of your passport. Other documents due May 1st. This includes airfare, project costs, hotel costs, and travel insurance.